Hahahaha, I hate when that happens. Gives me the jibblies when the thing finally does spring out of there. They laugh NOW, but wait until they feel the bready sting of… THE TOAST CANNON! Aha! It’s an anti-aircraft toaster! OMIGOSH! did you get that fomr dragon-tails??? sorry, fan of the earlier comics of dt. theres 2000 and ive read them several times. and that toast thing nearly happend to me a few times. >. It’s hilarious to read stories like this on Darwin Awards. The number of people who have stuck forks, knives, even spoons in the toaster. Nothing like a burning knife through your skull to wake you up in the morning, eh? The latest in ninja weaponry- TOAST SHURIKEN! YATTA! be glad he didn’t confuse a sawblade for the bread. Ever seen what happens if you leave a strawberry poptart in there for three minutes? Foot-tall flames- the Toaster From Hell. 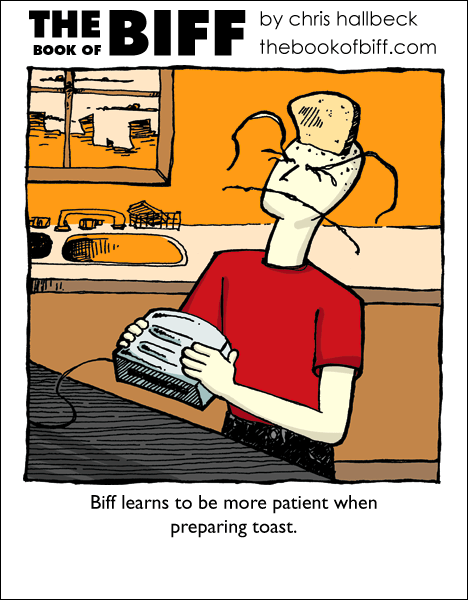 It was the toast of war, that was prepared to headbutt Biff right in his forehead VCR. the scary thing is, my gran’s toaster actally does that. the bread flies out and lands on the surface a good foot away. i thought it only happened in comics. The worst thing I’ve done with the toaster was burnt toast…not to where flames came…but I think my dog was afraid of it……stupid setting on the toaster…I was just trying to get it more browner. Speaking of settings…why does the toaster have the setting to where it burns the toast to a crisp that no one would eat? Asua: the highest setting is usually used for things that take much more to cook; we always used it for things like really tough muffins or bagels….or to defrost the tough muffins; it’s always worse when a rock hard ice-muffin pops out then a slice of toast. What about the 3rd degree burns on his hands? Whoot for nero’s random Invader Zim reference!